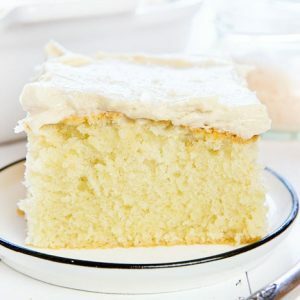 This Snack Cake with Caramel Frosting is as easy as it is satisfying! Bring first 2 ingredients to a rolling boil in a 3 1/2-qt. saucepan over medium heat, whisking constantly. Stir in cream, and return to a boil; then remove from heat. Pour into the bowl of a heavy-duty electric stand mixer. Gradually beat in powdered sugar at medium speed, using whisk attachment; beat 7 to 10 minutes or until thickened. Use immediately. Sprinkle frosted cake with sea salt.